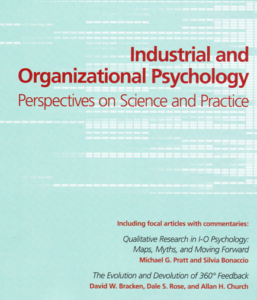 Dr. Rose has co-authored an article scheduled for publication in this month’s edition of Industrial and Organizational Psychology: Perspectives on Science and Practice (Volume 9 Issue 4) with colleagues David W. Bracken and Allan H. Church. In the 25+ years that the practice of 360° Feedback has been formally labeled and implemented, it has undergone many changes. Some of these have been positive (evolution) in advancing theory, research, and practice, and others less so (devolution). In this paper we offer a new definition of 360° Feedback, summarize its history, discuss significant research and practice trends, and offer suggestions for all user communities (i.e., researchers, practitioners, and end-users in organizations) moving forward. Our purpose is to bring new structure, discussion, and hopefully some degree of closure to key open issues in this important and enduring area of practice.